We have full kitchen and bathroom displays, along with doors, carpet, flooring, cabinets, windows, counter tops, plumbing fixtures and much more. We'll be happy to show you around the store and help you find just what you're looking for. Founded in 1960, Suburban Building Center has been serving builders, contractors, and homeowners for almost 50 years. 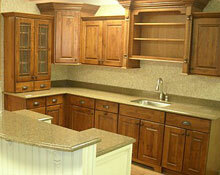 From custom millwork to residential and commercial construction and remodeling, Suburban Building Center does it all. Suburban Building Center carries a large inventory of brand name products from the leaders in the industry. At Suburban Building Center we offer delivery of all materials that we supply. Stop by or contact us for information on Suburban Building Center gift cards - a great way to make sure you're giving the perfect gift! Copyright © Suburban Building Center, Inc. All Rights Reserved.